Oregon’s King Tides Photo Project is winding down. The final King Tides are February 18 – 20, 2019. On Sunday, February 10 from 4:30 pm to 6:30 pm at Hoffman Center for the Arts in Manzanita. Dr. Hacker is a professor in Oregon State University’s Department of Integrative Biology and will discuss the interaction of dunes and the ocean, how the sea fertilizes dunes through the deposition of wrack, and how this relationship may be affected by the sea level rise, more intense storms and increased erosion anticipated with global warming. 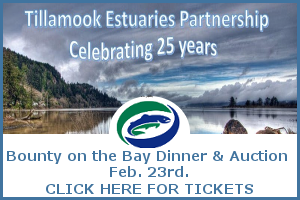 This event sponsored by Friends of Cape Falcon Marine Reserve, Haystack Rock Awareness Project, Oregon Shores Conservation Coalition, Oregon Department of Land Conservation & Development. Recently, I had a chance to chat with Dr. Hacker about her work. Q: What is the relationship between recent King Tides and our dunes? A: The King Tides Photo Project helps document how potential sea level rise would effect different communities. Beaches and dunes are experiencing these tidal events. Dunes in particular can serve to keep people less vulnerable to sea level rise and extreme storms. Q: Have tidal events been more extreme this year as opposed to previous years? A: I don’t think so just because we haven’t had very much rain. Usually when there’s been a lot of rain coinciding with an extreme high tide event, that’s when we’ve got flooding happening across roads and bridges in areas like the coast. Q: What is your particular focus on dunes? A: Prior to 1900, we had no fore-dune area. There was a lot shifting sand, blowing across roads, and into communities, basically causing havoc for residents. The decision was made to start planting beach grasses – one from Europe and one from the West Coast of the U.S. They grew rapidly and created a nice fore-dune area. That’s the kind of research I do, looking at the changes of the last 100 years: how grasses catch sand, what is the role the dunes serve to protect people and developments. Q: What are some of the challenges associated with coastal dunes? A: There’s all kinds of controversies about these grasses and the roles that they play. For some people, the fore-dune obscures their view so they are actively grading those dunes. For a long time, they would just do that, now you have to have a permit. There’s now more pressure on people to justify why they are grading. There’s interest from neighbors of people who want to grade that are worried about their protection from tsunamis, tidal events and storms. There’s a lot of interest swirling around this topic: should we grade, should we replant grass, what kind of grass should we replant. Our studies show that the type of grass you plant affects sand accretion, which then affects the shape of the dune. Q: When you’re discussing dune management, are you looking at disaster prevention? A: Absolutely. There’s a lot more interest in that, things like tsunami risks. Depending on the size of a tsunami wave, dunes may or may not protect you. There’s a lot of research in Indonesia, for example, where people behind dunes had a lot less damage than those who weren’t behind dunes. Obviously, having an open beach is the worst scenario for tsunami risk. Here in the Northwest our dunes are pretty tall because we have a lot of sand that’s brought up onto the beach. The East Coast is a completely different story where beaches are eroding, sand is leaving the system.